A gay Irish rower has set a new international record, after rowing solo for 49 days. Gavan Henninigan, a former alcoholic and heroin addict, completed the 5,000km row from La Gomera in Spain to Antiguia as part of the Talisker Whisky Atlantic Challenge. Despite finishing third, he still set a new International Solo Row Course record and an Irish Solo Row Record. Speaking to the Irish Mirror, he said it had been “relentless”, but he was proud of his achievements. “I had so many messages of support,” he added. “I’d get up some days and I’d be struggling, but when I read the positivity in those notes from complete strangers that would motivate me to get back on the oars and do it for them. The deep-sea driver also previously spent 15 years living in a squat, and had attempted to take his own life as he struggled to come to terms with his sexuality. He was one of four solo entries in the twelve boat race, with the other vessels manned by crews of two or more. During the race he rowed for up to 19 hours a time, burning 8,000 calories a day and losing 20 percent of his body weight. 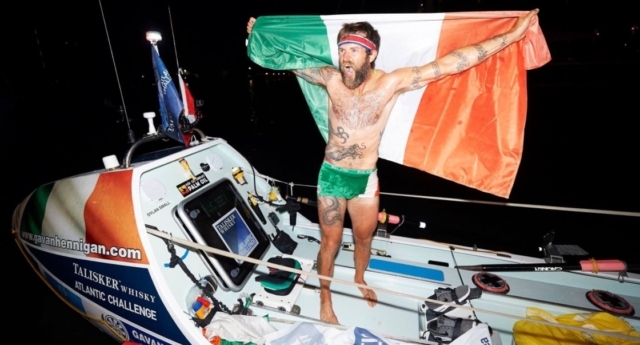 Finishing the race in 49 days, 11 hours and 37 minutes he became the fastest Irish person to row the atlantic solo, as well as becoming the fastest to complete the specific course solo. Previously, the fastest Irish man to complete a East to West crossing was Sean McGowan, who took 118 days in 2010.